Is there really anything to NOT like about summer? I mean, if I think about it long enough I can certainly come up with some things- tan lines, leather seats in cars, an ice cream shop running out of your favorite flavor, the smell of New York City, lukewarm drinks (specifically rosé). But really, at the end of the day, there is no summertime problem that you can't be easily fixed with ice cream, which is more than any of the other seasons can say for themselves. Obviously ice cream isn't the only great treat served up in the summer months. There's fresh berries, pie, soft serve, seafood, burgers, hot dogs, corn on the cob, fresh vegetables, salads, pickles, potato chips, lemonade, lobster rolls....I mean, can you even handle all of this??! Because I can't! Since lobster rolls seem to play a prevalent role in our summertime diet (I know, I know...#champagneproblems), I thought it was funny that I had never shared a recipe for them here on the site. So I thought I'd change that. But because I'm apparently an all or nothing kinda gal, instead of sharing just one recipe, I thought, why not share 5?! More is always better, especially when it comes to things like lobster, so it seemed like the logical thing to do. Oh, and remember our series "The Cooking Couple"? You know, the one where I force the Mr. to help me cook and then we take pictures and pretend like we lurve each other and we lurve cooking together (Ok, ok, it's not pretending...we aren't that good of actors!)? Yeah, that one. Well, we're transitioning it into a video series where you basically get to see us acting like the true weirdos that we are. Music, cocktails, dancing, drinking, strange faces, maybe some screaming, lots of hand gestures (for me, fulfilling the stereotypical role of the Italian in the kitchen), and probably some good food somewhere in the middle of it all. So if that sounds like your type of thing, roll on over (pun intended) to see our first video of, what else, but us making all the lobstaaaaah rolls?! To cook the lobsters: In a large pot, fill 2/3 to the top with water. Add in about 2 teaspoons of salt 2-3 bay leaves, the juice of a lemon and the empty lemon rinds themselves. Once the water has come to a boil, place your lobster in head first to the pot. For a 1 – 1 ¼ lb lobster the cooking time is about 12-15 mins. After that time, the lobster should be a bright vivid red color. One tip to determine if your lobster is done would be to pull an antenna or one of the small legs on the lobster. If it comes off easily then the lobster is done. Remove from pot and let cool for about 5-7 mins before you start to de-shell. To toast the buns: Brush the insides with melted better, then toast for a few minutes in a grill pan, on a grill, in a skillet or in the oven at 400 degrees. Please note, measurements listed are just rough estimates as they are based on the amount of lobster meat we were using as well as our taste preferences. 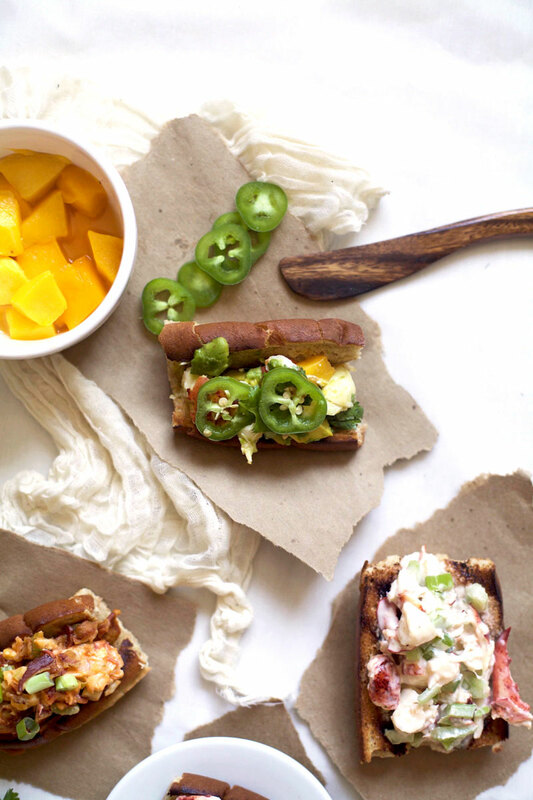 These recipes are more a guideline of what we put into each type of lobster roll, leaving you with the flexibility to truly make each one your own. As a general rule of thumb, we used about 1 tablespoon of mayonnaise or melted butter to every half-cup of lobster meat. What's your favorite type of lobster roll?